Richard Pynson was another dominant figure in early English printing. Born in Normandy in about 1448, he appears to have taken over the printing business of William de Machlinia (i.e. of Malines in Flanders) who along with Johannes Lettau (a Lithuanian? ), printed law books in London until about 1483. Machlinia continued to print in various London locations until about 1490, when his business apparently passed to Pynson, who had come to London from Normandy. Pynson established a successful business mainly printing legal documents and religious texts. He first operated in a shop in the parish of St Clement Danes (which according to Ohlgren, became occupied by another early printer, Julian Notary in 1500) and later at the corner of Fleet Street and Chancery Lane, at the very centre of the legal and governmental activity. 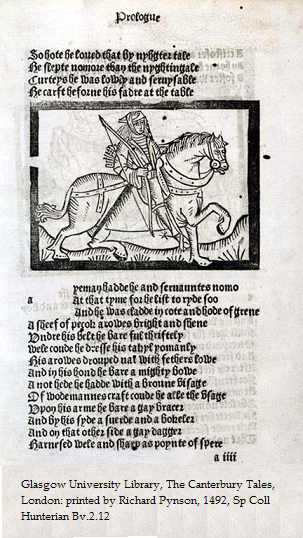 In a 40-year career he produced about 400 diverse titles, and apart from legal and religious works, he had printed a Latin grammar, an edition of The Canterbury Tales and a version of The Goste of Guy, before November 1492, when he issued Alexander Grammaticus’s Doctrinale, his first dated book. His Canterbury Tales is an exact reprint of Caxton’s second edition. Sir Beves of Hamtoun is another of Pynson’s early editions, and he must be credited with the first edition of Mandeville’s Travels, and of The History of Guy Earl of Warwick. There are also four small poetical pieces of a few leaves each. The earliest, The Life of St. Margaret, is only known from a fragment. The next is The Epitaph of Jasper Tudor, Duke of Bedford, generally ascribed to Skelton. The duke died in 1495, and the book was printed very shortly afterwards. The Foundation of the Chapel of Walsingham gives an account in verse of the miracle which led to the building of the shrine in 1061, and may have been printed for sale to the pilgrims who travelled there. The remaining piece is The Life of St. Petryonylla. In 1508, Pynson was appointed printer to the King, and much of his time was occupied in printing more or less official works and books relating to political affairs. This appointment carried with it a salary of £2 a year (raised to £4 in 1515) and the right to use the title of Esquire. In about 1518 he introduced Roman type into England, first using it to print a speech by the Papal Nuncio, Petrus Gryphus. Pynson taste was for serious literature and his work is generally considered to be superior to that of contemporary English printers, both in letterpress and illustrations. With his learned books and the official income derived from his work as king’s printer, he stood no chance financially against Wynkyn de Worde, with his romances, poetical tracts, and far more books in English; for as we know from the subsidy rolls, de Worde was the richer man. Pynson died in 1530, and it has been suggested that both he and Robert Copland, another early printer, were Caxton’s assistants, however there appears to be no evidence for this. William Copland, a relative of Robert, printed an edition of the Gest in c. 1560. 1493 The first edition of Dives and Pauper. 1494 An illustrated edition of Lydgate’s Falls of Princes, translated from Boccaccio. 1495 An edition of the Hecyra of Terence, the first printed of a set of the plays issued between 1495 and 1497. 1495? An edition of the Gest. 1503 A translation of Imitatio Christi, by William Atkynson, to which was added a spurious fourth book, translated from the French by Margaret, countess of Richmond and Derby. 1509 Barclay’s translation of The Ship of Fools. 1511 The Pilgrimage of Sir Richard Guilforde, an interesting account of a journey to the holy land, written by his chaplain. 1516 Fabyan’s Chronicles, the first of the series of modern chronicles. The work was compiled by Robert Fabyan, sheriff of London, who died in 1512. 1516 Kalendar of the new legend of England, a work of the lives of British saints. 1523-1525 The most important of his publications, the translation of the Chronicle of Froissart by John Bourchier. This page contains information found in The Cambridge History of Early Modern Literature, David Loewenstein and Janel Mueller, 2002; Typographic Milestones, Allan Haley, 1992; The Cambridge History of English and American Literature in 18 Volumes (1907–21), Volume II. The End of the Middle Ages, XIII. The Introduction of Printing into England and the Early Work of the Press; Robin Hood; The Early Poems, 1465-1560, Texts, Contexts, and Ideology, Thomas H. Ohlgren, 2007; Encyclopaedia Britannica.